We took an inspiring tour of the property and this building was a gardener’s dream with Adam in Marketing. The lush ivy embraced the architecture of this wood- sided county building. Of course, I always look for the flowers on properties and look what I came across! In full bloom, rows and rows of these pink ladies! Dr. Patricia Bragg loves her rose garden, and I definelty can see why.Roses arbors, trails, and meandering paths embrace you in sweet smells,perfuming the air. Dr. John Westerhall, explained to us that this rose collection is so loved by the community, that they invite garden groups here every year for annual tours of the property. At last, here we are around her serene fountain for a photo opportunity. We had a wonderful day exploring their organic farm in which they produce organic apples, a variety of vegetables, and rows and rows of greens and lettuces for the local children in the nearby school districts. (I wish I had a picture). Along with all this, they have recently developed and planted an extensive fruit orchard with exotic spieces as well as local California fruit. Thank-you to the Bragg employees, we had a delightful day. 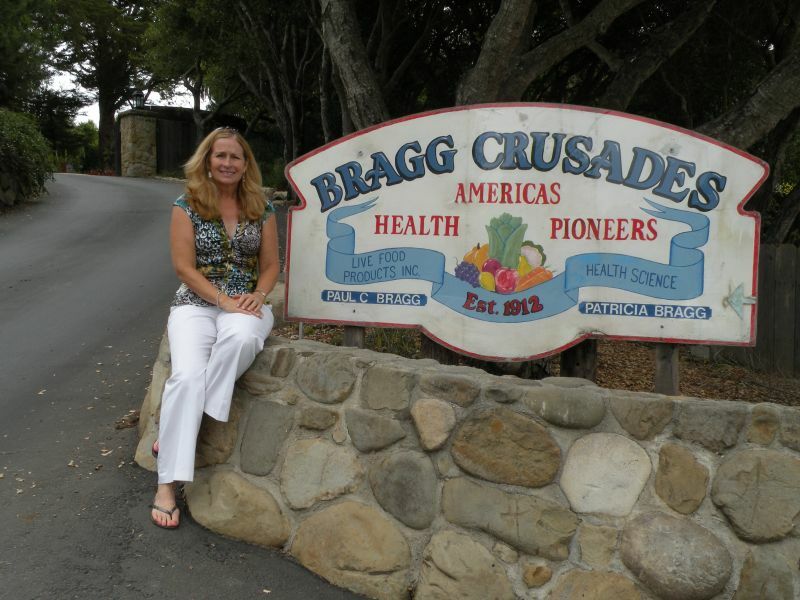 These are some great pictures and I am such a fan of the Bragg Group! All organic all the time- really the way this world should be going. Healthier and nutritious, and you can’t forget delicious! I spent a lot of time in Santa Barbara and I am so jealous you got to spend a day here! Looks relaxing! I was just there and I stayed at the Sandman Inn (www.thesandmaninn.com). So affordable and the location is just perfect! Super close to everything fun in Santa Barbara! Thanks for the comment! The property is beautiful with an organic farm, beautiful roses, and a stunning view! The staff was so welcoming and sincere. I had a wonderful time. This house reminds me of the English countryside and the vines crawling up the side of the house. I love it, the atmosphere of Santa Barbara is one of a kind and anyone lucky enough to visit and explore would know its an experience all in itself. They have such a lovely garden as well! I’m working on my own personal garden, hopefully it comes out half as nice! I travel to Santa Barbara a lot and I always stay at the Sandman Inn (www.thesandmaninn.com). Really inexpensive and right downtown! Oh I love your blog, it is so cute and well informed on everything Greek! I understand what it means to be Greek and everything around you to be well, GREEK! The festivals are great and so is Santa Barbara! I believe they have Greek festivals annually but I might be mistaken?! Anyway, lovely traveling there, always so much fun! These pictures are great, those gardens are gorgeous! I travel there so much and I would love to stay in a place like this! Or even close to this! The South Coast Inn (www.goleta-hotel.com) is my hotel of choice. Great for serious travelers looking for a nicer place to stay!